A battle between belief systems in rural 19th-century Ireland forms the backdrop for Kent’s (Burial Rites, 2013) unblinking examination of the corrosive costs of poverty and ignorance. Nóra Leahy becomes the object of gossip and speculation in the rural Irish valley she inhabits after the 1825 death of her laborer husband, Martin. Nóra’s desperate attempts to hide from her neighbors the existence of the severely disabled grandson who came into her care after the death of his own mother—Nóra’s beloved daughter, Johanna—soon come undone, and Micheál’s presence in the valley becomes the focal point of the malignant attentions of her fellow valley-dwellers, who are seeking an answer and anodyne for a reversal in fortunes that has beset the area. 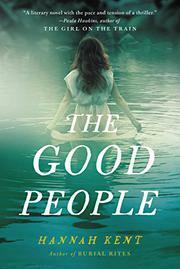 Long-standing belief in the destructive powers of “the Good People,” fairylike creatures whose motives and methods are the subject of endless speculation in Nóra’s agrarian community, leads to hostility against Micheál, who is suspected of being a “changeling,” substituted by the Good People in place of Nóra’s actual grandson. Nóra’s frantic efforts to recover the happy boy she comes to believe was spirited away by the Good People—who seem also to have visited new plagues and poverty on the valley—are aided by Nance, a grizzled, mysterious woman reputed to know the ways of the frequently malevolent beings, and Mary, a softhearted young household maid. A nerve-wracking series of efforts to banish the creature thought to be masquerading as Micheál illuminates the clash between traditional values and ways of life clung to in the valley and newly emerging beliefs in science—and perhaps a different brand of superstition—encouraged by clergy, the more educated, and residents of a nearby city that seems worlds away. Kent’s well-researched tale is inspired by newspaper reports of an actual attempt in 19th-century Ireland to banish a changeling. Peppered with Gaelic words and phrases and frequent references to bygone beliefs and practices, this brutal telling of a brutal story invites discussion and revulsion. If Stevie Wonder is correct, when you believe in things you don’t understand, then you suffer. Kent’s novel validates his indictment of superstition.